In 1910 Arthur Stafford Crawley (subsequently Canon of Windsor, 1934-1948) had been appointed to a chaplaincy and to the living of Bishopthorpe by Cosmo Gordon Lang, the Archbishop of York. In 1915 the Archbishop gave him leave to volunteer with the British forces in France. Crawley initially spent two months in an unofficial capacity at the Anglo-American Hospital at Wimereux, on the coast south of Calais. During his service in France, Crawley wrote almost daily to his beloved wife, Anstice, while keeping closely in touch with his immediate family (he had two sons) and extended family and friends. In letters now preserved in the St George’s Chapel Archives [SGC M.126/F/1-754], he writes of his life at the Anglo-American Hospital and gives a vivid picture of his surroundings, his work at the AA Hospital, impressions of the war and comments on the Home Front. Crawley’s correspondence with his wife had to be passed by the official censor; at the outset he finds his letters may be swiftly posted if taken to the censor office at a nearby hospital. Surviving envelopes of his letters bear the censor’s stamp. Words are occasionally blacked out in his earlier correspondence and in one case the figures stating the numbers of injured soldiers are excised. In his second assignment, Crawley never gives his location other than stating his assignment to, for instance, the 4th Field Ambulance, Guards Division, B.E.F. On first arriving at Wimereux, Crawley finds the AA Hospital to be in “a nice little place”. The villas are mostly shut and small hotels have been taken over as hospitals, whereas the Australian Hospital occupies the club houses of the nearby golf club. Crawley soon organises a daily service for injured servicemen, nurses and orderlies in the biggest ward and gives Communion to bed-ridden patients in their own wards. Lady Hadfield, the provider of the AA Hospital, expects to have her own way, but has quarrelled with the Matron, the wife of an army officer: Lady Hadfield cannot realise that the hospital is run under military discipline. The patients due to return to England on the hospital ship are carried out to the motor ambulance on orderlies’ backs or stretchers; “the poor fellows are delighted when the red tape is tied to the foot of their beds, the sign they are due for the next boat”. Crawley was soon to be writing to his wife commiserating with her grief at the death in action of her brother Eustace. Life, he writes, can never be the same again and too much has gone wrong. He knows she will call up all her courage – it is just part of the cost she has to pay for her country, as also it is for those who die in war. Crawley liked the organisation and cheerful atmosphere of both the AA Hospital and nearby Australian Hospital. He reports that the French hospitals, relying heavily on nuns, are less efficient and haven’t had time to develop their Croix Rouge. The Belgian hospitals badly need help. Crawley is cheered at news of preparations for the Dardenelles campaign and thinks that, if successful, it will help to shorten the war. But he deplores the strikes by Clydeside workers, feeling that a reduction of the output of raw materials will cost hundreds of British lives. He blames the employers for lack of generosity and for taking over-large profits and thinks British people don’t realise the seriousness of the situation. In his unofficial role, Crawley had to take every opportunity to find out how the war effort was being managed. He is excited at being taken to see an armoured train and to visit Béthune, Merville and other places behind the lines, crossing territory formerly held by the Germans, where now British troops are being concentrated. He sees some trenches, wire entanglements and a gun in position, concealed but not fired. He observes troops going back and forth from the trenches and realises a forward push is imminent. Two days after the allied advance had begun (March 10th) The Times reported the fall of nearby Neuve Chapelle to German Forces. Admissions to the AA Hospital were high, those who were less seriously injured being quickly returned to England. Crawley writes that at the hospital they see some part of the price paid for success in battle; he hopes there will be worthwhile gain from all the casualties, realises he is seeing only a tiny part of the fighting and cannot imagine what is going on at the Russian Front. Crawley regrets that military people are annoyed with the Archbishop for maintaining Christian principles: if Britons degenerate into hatred of the Germans, to retaliate by asserting such principles becomes humbug. Some officers are upset at the inability of the British public to take the war seriously – Britain is the only nation relying on volunteers and the French are asking why they should fight Britain’s battles, while the English still talk of football and racing. Perhaps, says Crawley, the British public will come to understand from the allied advance what the army must expect in the summer. The previous day’s Times was delivered daily to the hospital, but Crawley asked his wife to send the Times Literary Supplement, also up to date magazines for the soldiers. Not permitted to wear uniform of any kind, he requests that extra clothes be sent to him, brown breeches, brown leather boots, puttees and kid gloves, also a shaving brush and shaving gloves. He expected to be sent a cake each week, enjoyed receiving dark chocolate, and asked for cigarettes, matches and playing cards for the men. A keen musician, Crawley practised and took part in concerts and organised a glee club for soldiers, officers and orderlies. Crawley was required by his Archbishop to return to York in time to prepare for the Easter services. He returned to France in September 1915 and served for two years as chaplain in the Guards Division of the British Expeditionary Force, commanded by his brother-in-law, the Earl of Cavan at the Western Front. 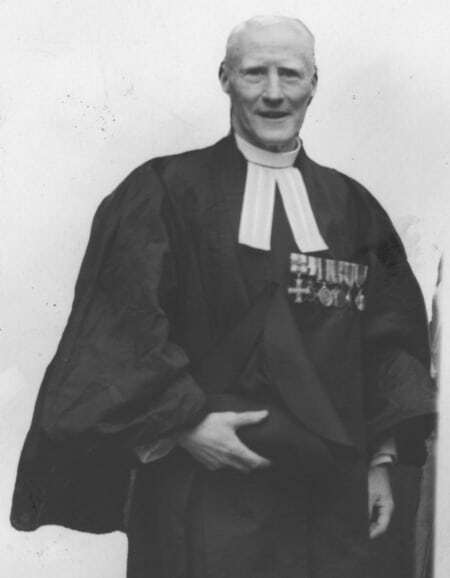 In this photograph taken of him during his time as Canon, he can be seen wearing the medals he received for his time in service.